Do you ever get in a dry spell with God? You know…those times when you’re praying the same things over and over again? Or you’ve stopped praying altogether. Or, do you find yourself at a loss for words only minutes into praying? Does your mind wander away? All too often it takes a crisis to pull someone out the pit of these problem to they can come back to God with undivided attention. That’s a shame because waiting for a crisis is so unnecessary. 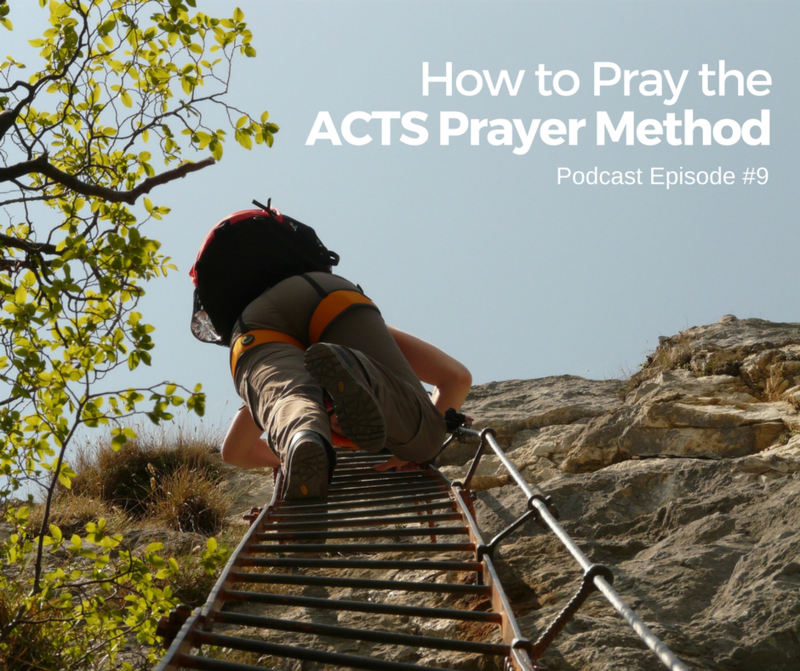 I cover each element of the ACTS prayer method in detail in today’s podcast. Below you can find a brief description of each piece. Also, I have a free downloadable two page worksheet to guide you in this super easy practice. What does it mean to adore someone? It means that you love them. You love who they are and what they do. When I adore God I use what I call the formula of praise. This formula is a recurring pattern I noticed in the Psalms. David adores God in three ways: First, he tells God that he loves Him. Second, he praises God for who God is. Third, he praises God for what God does. To learn more about the formula of praise and to see examples click here and read the post, The Formula of Praise. When I extol the goodness of God through adoration I find myself humbled. I am reminded of my sins. So I move from adoration into confession. When you confess try to be specific about acknowledging what you have done wrong. Get beyond generic confessions such as, “I haven’t been as loving as I should be.” Be specific, “God I have been avoiding Janet because I am angry with her. Forgive me for pushing her to the side so that I don’t have to deal with my anger. It is sinful for me to not give her the grace I have received.” Being specific will help you change. Notice in the example that I actively acknowledged my action as sin and why it is wrong. That sort of processing your actions within your prayers will help you change, but you only get there by being specific. To learn more about confession click here and read the post, Eradicating Spiritual Virus. I am not sure I need to say much about thanks because most of us readily know how to say thank you and what gratitude is. I do want to point out two things. First, my experience has been that having thanks in my prayer model forces me to consider what I am grateful for on the days I feel less than grateful. Paul told the Colossians, “Whatever you do in word or deed, do all in the name of the Lord Jesus, giving thanks through Him to God the Father.” (Colossians 3:16) Second, I actively give thanks for the whole of creation. I don’t only focus on the people and circumstance of my life. I give thanks for the earth, the plants, the trees, the animals, the birds, the stars, the sun, and the moon and all of these amazing pieces of creation that God has intricately woven together to make life possible. To supplicate simply means to ask. At this point in your prayer offer God the concerns of your heart. Pray for friends, family, community, situations and yourself. Pray for whatever concerns you. Take time to intercede for others. I used to think that intercession just meant praying for someone else in general. However, as I studied the scriptures about interceding, I noticed that intercession almost always means praying about someone’s spiritual well-being. You may want to adopt someone specific to pray for daily. I find that to be a very powerful prayer discipline. Lastly, when trying a new prayer discipline like praying A.C.T.S. prayers, do it for several weeks before judging the merits of the practice. Your entire first week you may be just getting comfortable with the practice. I highly recommend living into a practice a minimum of three weeks. Research suggests that it takes as much as 18 days for something to become a habit or norm for us. Persevere for a season so that you can see the fruit. This two page download provides a reference sheet with tips to guide you in get the most out of each step AND a fill in the blank ACTS Prayer Template. Use it again and again. Access all of the podcasts on the podcast archive page at anytime or click the button below to subscribe on iTunes and never miss an episode. If you enjoyed this post and are serious about improving your prayer life immediately check out my book “Tips on Prayer, The QuickStart Guide to Improving Your Prayer Life. CLICK HERE. @Cheryl, I haven’t used the book, Praying in Color, but I am familiar with it because a friend of mine has it. Combining it with the A.C.T.S. prayer model is a great idea. Thank you for sharing. You are missing the last “S” its A.C.T.S.S. the last “S” is for silence. Now it is your turn to listen to what God is telling you. Listen to His answer, not the answer you want to hear. His answer may be to wait. (e.i. a job for you, but a person needs to retire first or the job needs to be created) His answer may be that you need to do something to obtain that which He knows you really need. (Ei volunteer somewhere in order to find the peace you really need, not get better organized) That is why you need to listen to and for His answer. His answer may come via another person while your talking. His answer may come into your mind as if you just thought of it. His answer may be there when you wake up in the morning. Prayer is a conversation between you and Him. Not you and a mirror. Joyce, you are spot on with your addition of the letter “s” for silence. It is amazing what God can do in just a few moments of silence if we will but quite ourselves and listen. Several years ago, I realized that if I was serious about all of the many prayers that I made seeking God’s guidance and wisdom, then I would be still and listen after making them. I typically was asking God to teach me or reveal things to me but then spent no time actively listening. Once I did, it really opened some doors. When I listen I don’t get an audible response from God. I get very clear thoughts that I have a peace around that is qualitatively different from any other feeling I have. I get memories, dreams and some times extremely vivid imagines that come to mind. I get scripture passages popping off of the page and extremely God-incidental events and conversations occurring. I find God speak in a wide array of ways. I find some christians to be skeptical of God speaking in these various ways, but scripture is quite clear that God reveals himself through a multitude of means. Again, thank you for your comment. It added some great value to the post. Hi John, I was introduced to you website by some your friends in Logansport! They speak very fondly of you! I have found that singing worshipful hymns and songs helps tune my heart to adoration. As I begin using the ACTS method of prayer this helps me focus on God’s worthiness and attributes.. I have tried to use the ACTS method in the past, but your description of each step and how they fit together has made it come alive in a powerful way. Thank you! 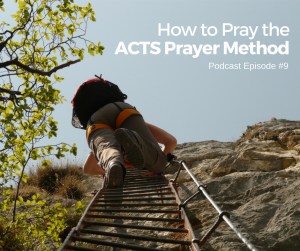 Jim, how encouraging to hear what a difference the ACTS prayer is making for you. It is one of my favorite forms of prayer. Thanks for the tip on singing. 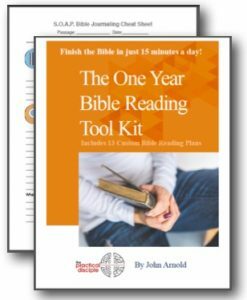 This past week I finished my first draft of an ebook on prayer that I will release soon and I think I will add your tip. Would you mind me quoting you in it? Also, tell my Logansport friends Hello. I am taking a sabbatical leave this Summer and hope to visit Logansport during my time off. We loved living there. Lastly, thanks so much for commenting. I always love hearing from readers. Of course! I am honored! Will pass info about your trip to Logan to the Reinkings!